How many gallons water do you think the average person uses per day? Believe it or not 170 gallons! That's 2.8 gallons per minute! You could conserve water just by changing out your showerhead and replacing with an eco-friendly, efficient one. 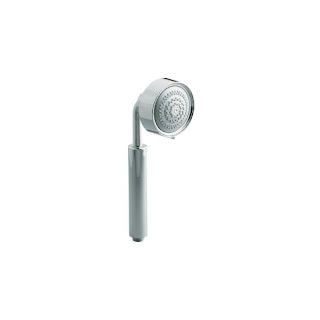 I've been wanting to replace my showerhead with a handheld one for awhile. I love being able to choose my water coverage - concentrated, focused or full, wide spray with this new Kohler handshower. It's a feature my previous showerhead did not have. The three-function spray delivers 1.75 gallons per minute, saving up to 30% water consumption versus conventional handshowers. It also has an ergonomic spray head, allowing me to easily adjust the direction of the water. The 60" hose definitely makes it easier to clean my bathtub. When I don't use the handheld showerhead, I just keep it in place by mounting the hose on the shower arm mount. The handshower model I have is part of the Purist collection. It is very sleek and sculptural in design, with a polished chrome finish. It definitely has stand-out appeal. I feel like it's saying "look at me" since it's not modest nor petite looking. I've never paid attention to how much of a difference a showerhead can make but it certainly does, in design, function and conserving water. With my new handshower, I'll be saving more than 10,000 gallons of water each year! Thank you Kohler! Go to www.kohler.com to learn more about Kohler's products and services.